The overall goal of the Center is to understand the mechanisms of pathophysiology of diabetes and obesity and their cardiovascular complications. The Pathology and Bio-analytics Core is an integral part of the Center and will play a key role in the evolution of COBRE-funded projects. The Core will render services for rigorous and comprehensive pathological analysis of diabetic specimens. Support current COBRE and Center projects. The Core provides intellectual input and technical expertise to address the needs of the COBRE-supported junior investigators and other Center members. The Core provides services such as histology and immunohistochemistry using standard techniques. Metamorph digital imaging software is used for morphometric analysis and other quantitative assays. Educate and train investigators. The Core not only provides technical services to the Center, but also educates investigators, especially our COBRE-supported junior investigators, about the principles of histology, chromatography and mass spectrometry. This will enable them to develop conceptual frameworks and execute well designed experiments. Develop new protocols and techniques. Core personnel attend conferences and workshops to educate themselves about advancements in the field. The Core continues to expand its knowledge-base and technical expertise to satisfy the future needs of the Center. The Core is located in Delia Baxter Building at the Health Science Center at The University of Louisville. Histology: The Core is fully equipped for the embedding, processing and cutting of paraffin sections. For cutting frozen sections, the Core has a cryostat. A variety of specialized staining and immunohistochemistry is routinely performed at the Core. Multiple microscopes and digital imaging system are available for acquiring the images and their analysis. Hematology: Hematology consists of hematocrit and complete blood cell counts including RBCs, WBCs and platelets (these studies are performed in collaboration with Core B). Lipoprotein Profile: Lipid profile consists of plasma cholesterol, triglycerides and phospholipids. Plasma lipoproteins are separated and analyzed on FPLC. Whenever required measurement of particle size of lipoproteins is measured by NMR at commercial sources. Metabolic panel: In the metabolic panel, plasma pH, electrolytes, total carbon dioxide (TCO2), calcium, creatinine and blood urea nitrogen (BUN) are assayed. Hepatic panel: Liver function tests includes serum albumin, total protein, total and direct bilirubin, alkaline phosphatase (AP), alanine aminotransferase (ALT), and aspartate aminotransferase (AST). Renal panel: Renal function is assessed by BUN and interpreted concurrently with urine creatinine, ketones, specific gravity, albumin, protein, electrolytes, and glucose concentrations. Gross pathoioav: Morphological and pathological analyses are performed in the liver, kidney, lung, aorta, and heart of diabetic and control animals. At sacrifice, tissues are weighed, paraffin-embedded, sectioned and stained with hematoxylin and eosin and analyzed for pathological changes. Liquid Chromatoqraphy-Mass Spectrometrv Assays: The Core has multiple liquid chromatography- mass spectrometry (LC-MS) systems and routinely measures multiple analytes in various tissues, plasma and urine. The UofL Pathology & Bioanalytics Core offers several services for center members as well as other investigators and UofL faculty. 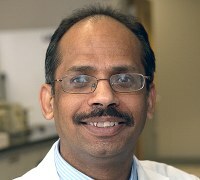 Dr. Srivastava is a Distinguished University Scholar and Professor of Medicine, Division of Cardiovascular Medicine at the University of Louisville. He has more than 20 years of experience in the area of cardiovascular complications of diabetes.